We had heard that steaming is both wholesome and efficient for cleaning hard floors. Who would not want a natural way of attending to such chores without the use of nasty chemicals? Well, in this Steamfast SF-275 review, we cover a popular canister-type machine that brings clean, sanitizing steam to wherever it is needed. Many homeowners already deploy this wheeled, low-profile steamer to tidy up high-traffic areas. Parents like using it to keep baths and counters clean in a manner that is safe for their kids. Stains on tile flooring that are challenging to remove with manual scrubbing are readily undone by the forceful impact of jetting steam. The technique can require more effort than a total scrub, but is also less pricey and more convenient than replacing the flooring. Steam cleaning will work safely on most wooden laminate flooring if applied carefully with a mop accessory that is designed for the purpose. Laminate floorboards readily withstand spills on occasion, but the excess moisture that keeps getting deposited as time goes will cause interior damage at some point. Be wary of using a commercial carpet steamer for this task. The highly-pressurized and ‘wet’ steam of these specialized units generate will soak through the floorboards’ edges and into their inner layers. Meticulous mopping using regulated amounts of steam is a safer method in such cases. Cleaning hard floors is not the only task the unit can do well, it excels at eliminating bed bugs as well. These tend to spread quickly and can be challenging to eradicate. Steam applied at a temperature of 200°F or more will eliminate these household pests while sanitizing the affected area at the same time. This compact canister-type model generates jets of hot pressurized vapors that can loosen and dissolve most of the tough stains that build up on grout lines in tiled floors. The nozzle points the jet of steam to wherever it is required, the quick-release switch was simple and predictable in use. The boiler is designed to generate jets of vapor at 200°F or higher temperatures. A decent amount of steam was made available that allowed us to clean affected areas with less waste of time. The body has a robust build and weighs less than 16 pounds. Similar to other low-profile canisters, the base is readily maneuvered into various rooms. We only had to fill the boiler about three-fourths full, switch on the power, then wait for pressure to build up before triggering the control switch. Almost an hour of steam operation is possible. However, the 12-foot power cord may not provide enough reach in the largest rooms. The long hose length and the supplied extensions help to compensate for this, thankfully. Included with the base unit is a variety of accessories, such as the jet nozzle, hose extensions, a medium corner brush, long and short nylon brushes along with a brass utility brush, a scrubbing pad, and a steam mop accessory. Only the standard one-year warranty is offered by the manufacturer. As boiler components are known for breaking due to irregular manufacturing quality, it pays to buy from resellers who offer an extended warranty. One nice feature of this unit is that it normally takes less than 10 minutes to generate a continuously steady stream of pressurized steam. This is a quicker start that that larger-volume designs cannot match. A regular load of steam usually lasts for about 45 minutes, which can be prolonged with careful control of the steam trigger. A bigger water volume would have allowed lengthier steaming sessions between refills. Things needed to cool down before more could be added safely, after which we had to pause again as steam generation restarted. We took care not to top off the tank, for overfilling it would have left little space for the expanding steam to form under pressure. Giving the trigger a few pulls over the first 5 minutes eventually gets the water running and steam building. We regularly begin with the low setting then raise levels as necessary, all while customizing the output for different jobs. Light steam is good for light-colored walls and similar stuff, while heavy steam is needed to handle tougher bathroom and kitchen trouble spots. 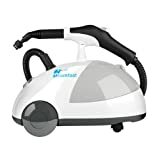 Readily available online at Amazon.com and with free shipping and extended warranties in some cases, this steam cleaner nets a lot of positive reviews. The affordable Steamfast SF-275 Canister Steam Cleaner is great for simple but effective sanitizing without the use of detergents and other chemicals. The included accessories will let you configure the unit to handle just about any household steaming task. We can recommend this reasonably-priced model to any home or shop owner with hard floors to clean.